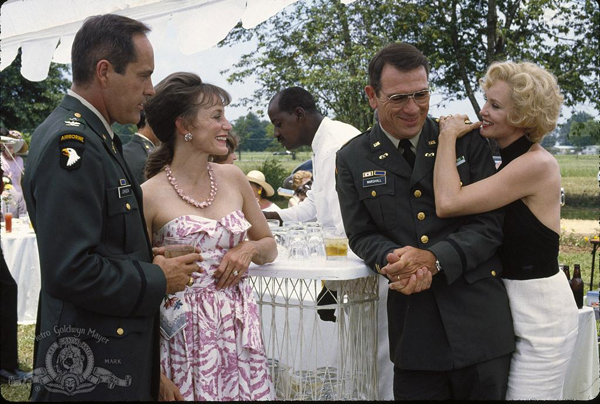 For most of us, the '60s-set drama Blue Sky lingers in the memory - not so much for the movie itself than for the way it served as the catalyst for Jessica Lange's surprise Best Actress Oscar win in 1995. How did a movie that barely anyone had heard of (much less seen) become a major award-winner? Filmed in 1991 but shelved for several years due to the Orion studio's bankruptcy, Blue Sky could now be viewed either as an inspiring come-from-behind story, or as a cynical precursor for the insane behind-the-scenes award campaigning so commonplace nowadays. Regardless of how you approach it, the arrival of this movie in a solid Blu Ray transfer from Olive Films is a welcome sight. Given Lange's forays into playing deranged ladies in projects like Grey Gardens and American Horror Story (not to mention 1982's Frances), one would be correct in assuming her Blue Sky character, Army wife Carly Marshall, has a few loose marbles. Lange's work is especially skillful in this movie, however, since her character comes close to appearing psychotic without ever completely losing it. Here, she strikes a complex blend of toughness and vulnerability as a once-aspiring actress and natural born flirt whose stubborn unwillingness to settle into traditional motherhood upsets her husband, Hank, played by Tommy Lee Jones. As an Army nuclear weapons expert with unpopular opinions on atomic bomb testing, Hank's standing with his superiors is constantly undermined by Carly's flirting with his fellow officers. Along with their military brat kids (Amy Locane and Anna Klemp), the Marshalls are reassigned to a base in rural Alabama. Although the stress of constantly moving damages Carly's fragile psyche, Hank's calm reassurance helps keep the family together - despite the two daughters' resentment over having to deal with a nonconformist mom. Lange's fearless performance remains the most memorable thing about Blue Sky, although it's actually a solidly written and directed drama with a uniformly strong cast. The expert supporting players include Powers Boothe as an officer who pursues an affair with Lange, along with Carrie Snodgress as Boothe's guarded wife and Chris O'Donnell as their teen son who develops an interest in Locane's character. Especially with Lange, Jones and their two kids, one gets the sense of a real family dynamic and not actors acting - a strength of British director Tony Richardson (Tom Jones; The Loneliness of the Long Distance Runner). Abetted by some terrific production design evoking the early '60s, this could have been a true gem - but the story tends to derail a bit after Jones' Hank is assigned to oversee a classified project (the source of the movie's title) involving underground nuclear bomb tests in the Nevada desert, leaving the family behind in Alabama. A near-accident at the test site results in Hank being reprimanded, prompting Carly and the girls to go on a cross-country road trip. The effort to prove her husband's innocence makes Carly a more level-headed, responsible person (and gives her a bit of the fame she's always craved), but it also makes this movie into a more routine woman-does-good tale. Olive Films' edition of Blue Sky is a solid update on MGM's old DVD release, which was reviewed by DVD Talk's Aaron Beierle way back in 2001. Although he was lackluster on the a/v for that disc, the high-resolution transfer employed on Olive's release looks pretty handsome for a decades-old movie shot on celluloid. The 1080p 16:9 image preserves the film's pleasing grainy texture, while the high-def transfer brings out the photography's appealingly soft color palette, suffused with darks that are rich without getting too murky. The Dolby 5.1 sound mix from the DVD is retained here. While it has a slight bit of hiss on the high end, this was an evenly-balanced track that well-integrates '60s-era pop songs and Jack Nitzsche's original scoring. Dialogue is clear and pleasant, for the most part. Like other plain-Jane Olive discs, it lacks subtitles or alternate audio (hold on to the DVD in case you want the French and Spanish-language dubs). Despite powerful work from Tommy Lee Jones and Oscar winner Jessica Lange, Blue Sky seems to have turned into one of those acclaimed-in-its-day '90s movies that has fallen through the cracks. It's actually a satisfying, solidly crafted drama, however, given a decent if extra-free treatment on Olive's Blu Ray release. Recommended.